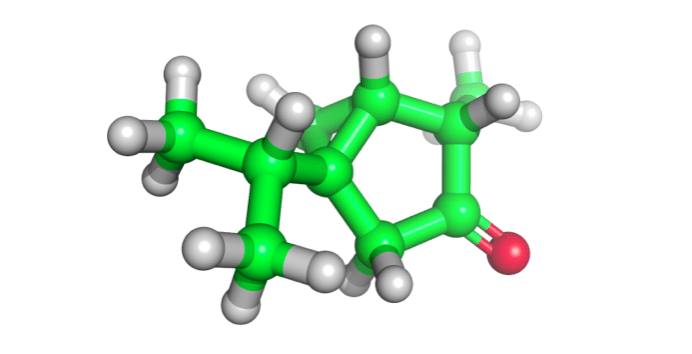 Thujone is hallucinogenic cyclic monoterpenoid which occurs naturally in the form of two isomers: the less common (-)-α-thujone and the more popular (+)-β-thujone, also known as isothujone (Fig. 1). 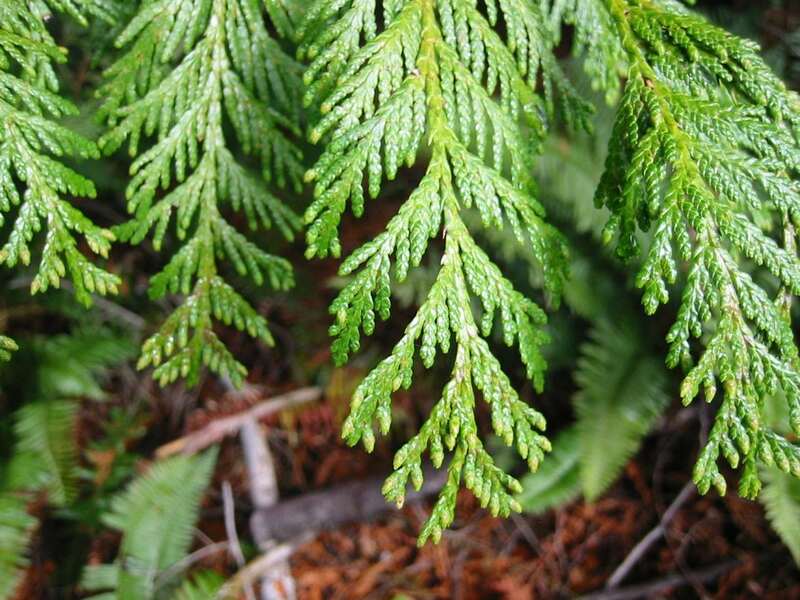 This compound is a major component of essential oils extracted from wormwood, tansy, sage, or thuja. These oils have applications in the treatment of seizures, problems related to the spleen, urinary disorders, common cold, wound healing, and have antimicrobial, antioxidant, hepatoprotective, and neuroprotective uses. A very famous product containing thujone is absinthe, a highly alcoholic beverage made with wormwood, produced by ethanol maceration of herbs mixture containing mainly wormwood and anise, and then distillation of this macerate. Absinthe contains 40-70% alcohol and is widely used as a food product, beverage of artists (fabled Green Fairy), and medicinal drink. Due to the hallucinogenic properties of thujone, current EU law limits the content of this compound in alcoholic products based on wormwood, allowing maximum of 35 mg/kg, which in practice means up to about 1.2 mg of thujone in 40 mL glass of absinthe. Among many different sensitive techniques for thujone determination chromatographic methods are dominate (HPLC or GC), but the cost of these analyses is relatively high and fraught with possible errors in the preparation of the sample. For this reason, a new simple, sensitive and rapid method for thujone determination was developed, using differential pulse voltammetry (DPV) and Controlled Growth Mercury Drop Electrode (CGMDE). After optimization (such as: composition of supporting electrolyte, concentration of surface-active substance i.e. Triton X-100, operational parameters of voltammetric measurements, influence of interferents), the DPV recordings were performed in conditions: pulse amplitude = 50 mV, potential step = −2 mV, waiting and sampling time = 5 ms and potential range from +200 to −800 mV. As a supporting electrolyte composition of 0.05M potassium nitrate, 0.0002% Triton X-100 and 9.6% ethanol was used. The calibration graph was linear from 0.7 to 115 mgL−1 and the detection limit was 0.6 mgL−1, with the correlation coefficient of 0.9980 (Fig 2). The influence of various concentrations of metal ions (such as Bi3+, Cd2+, Cr3+, Cu2+, Pb2+, V3+ and Zn2+) on the measurement results was also determined and it was proved that the low concentrations of these ions in the sample didn’t affect the results. Under optimized measurement conditions thujone reduction process that occurs on the surface of the active electrode is a 2-electron quasi-reversible electrochemical reaction, controlled by adsorption. 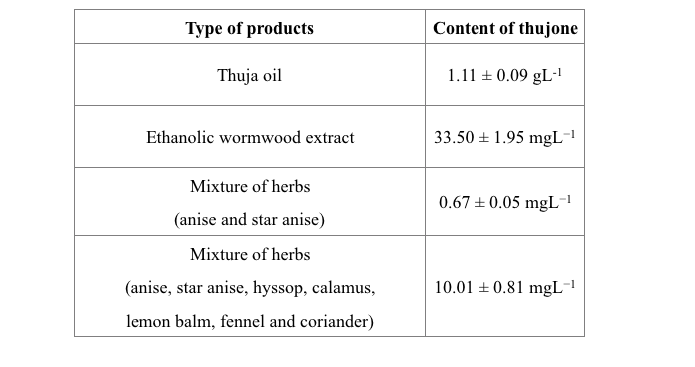 The proposed new analytical approach was used in determination of thujone in commercially available thuja oil, ethanolic wormwood extract and specially prepared mixtures of herbs as seen in Tab. 1, thus proving the usefulness of the developed method. Proposed methodology − using the DPV technique and the CGMD electrode − are recommended to determine of thujone on low level of concentration. This method is sensitive, fast and simple, and does not require preliminary sample preparation. The practical application of presented method can greatly simplify the process of electrochemical detection of thujone and reduces operational costs. These findings are described in the article entitled Voltammetric determination of thujone in herbal matrices in the presence of Triton X-100, recently published in the journal Analytical Biochemistry. The work was led by Mateusz Kowalcze and Małgorzata Jakubowska from AGH University of Science and Technology in Cracow. More information on the toxicity of thujone and absinthe profiling can be found in the article entitled Voltammetric profiling of absinthes published in the Journal of Electroanalytical Chemistry. Mateusz is a research scientist at the AGH University of Science and Technology in Kraków. Malgorzata is currently a research scientist at the West Pomeranian University of Technology, Szczecin.